GILGIT, May 19 (APP): Prime Minister Muhammad Nawaz Sharif Thursday said his government was committed to the progress and development of Gilgit Baltistan and would ensure provision of all resources to bring it at par with the developed areas of the country. He was addressing an event after administering oath of office to six members of the Gilgit Baltistan Council, who are elected by the GB Legislative Assembly. 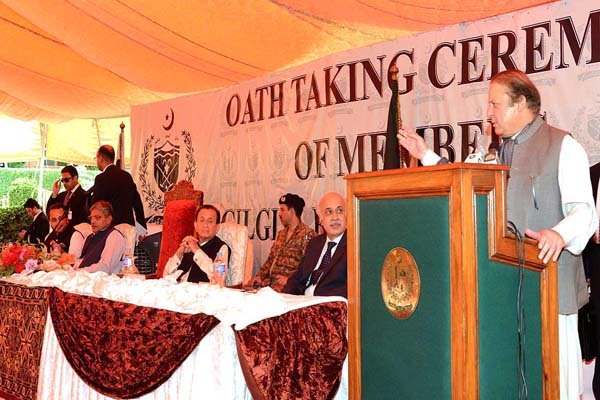 The Prime Minister in his capacity as Chairman Gilgit Baltistan Council administered the oath. The six new members who joined the 12-member Council included Syed Afzal, Sultan Ali Khan, Ashraf Sada, Syed Abbas Rizvi, Arman Shah and Wazir ikhlaq Hussain.